The chartreuse walls invigorate the space with a spring-time feel and the colorful fabrics are so youthful and vibrant! Did you notice the soft contrasting color of the ceiling? 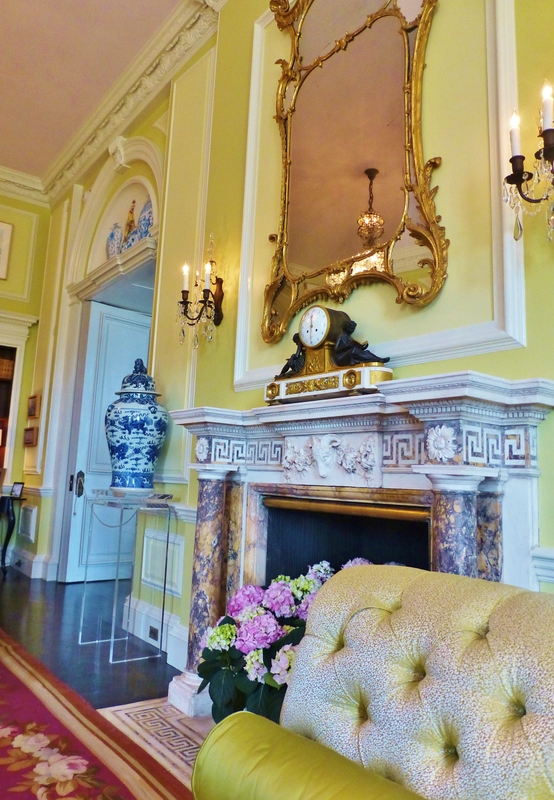 The amazing Blairsden, site of this year’s Mansion in May, has so many gloriously designed interior spaces. One of my favorites can be found early in the tour, just off the entrance to the home. 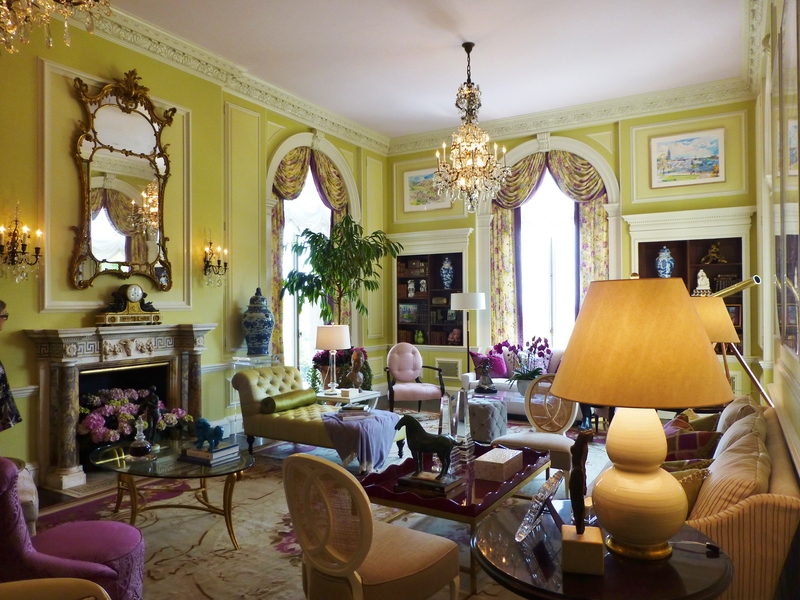 It’s designed by Barbara Ostrom Associates, to be the Drawing Room of the original homeowner: Mrs. Blair. I declare that Ms. Ostrom has officially accomplished her mission–as this is a wonderful, fresh, and brightly-colored space, filled with many special treasures. I would certainly be happy living here! Mrs. Blair’s Drawing room is a colorful exotic retreat. I found that pops of ‘Radiant Orchid’ (Pantone’s color of the year) helped to lead the eye throughout the space, and kept the room on trend. The original fireplace mantel shines when surrounded with this chartreuse green wall color and fabrics. Blue and white porcelains are also a feature in the space. Using bold color combinations keeps serious antiques from feeling too stuffy, especially when used with contemporary upholstered pieces in light-neutral colors. 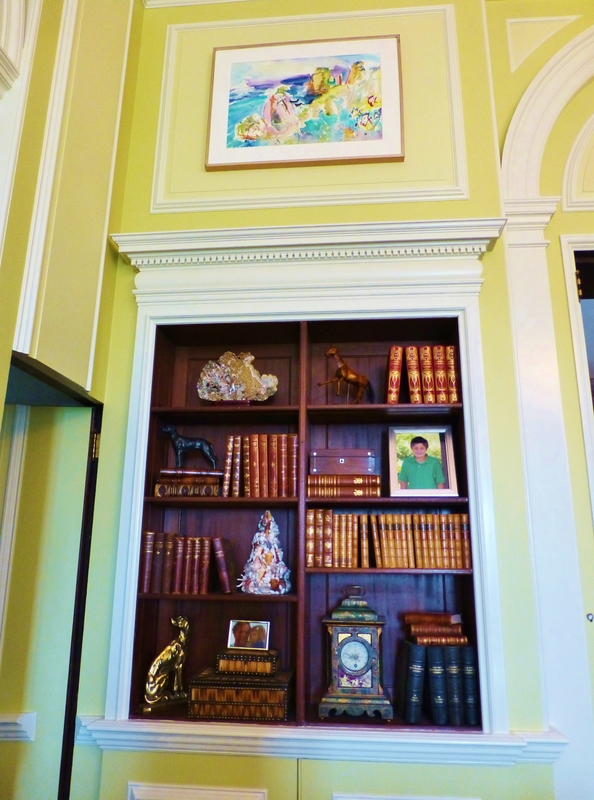 Notice the whimsical monkeys hand-painted above the artwork and amongst the blue & white porcelains at the over-doors. Light neutral sofas and chairs are combined with bold pillows and contemporary artwork. 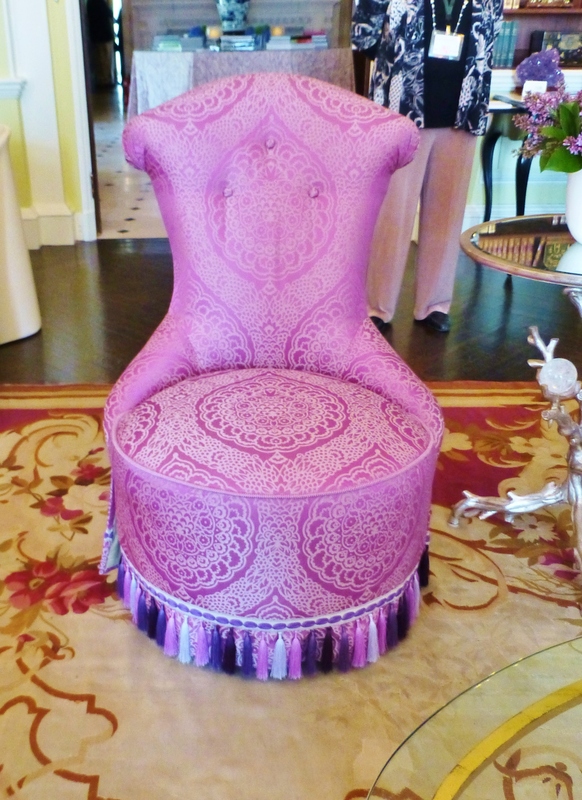 I adore this ‘Radiant Orchid’ slipper chair near the entrance to the room. It becomes sculpture, floating near the fireplace. Don’t you just love its curvy lines, saturated colorful fabric, and the fabulous fringe at the base?! The built-in bookcases are filled with luxurious antique books (a favorite of mine) and lovely accessories. You can also see the detail of layered color on the walls and trim in this photo. 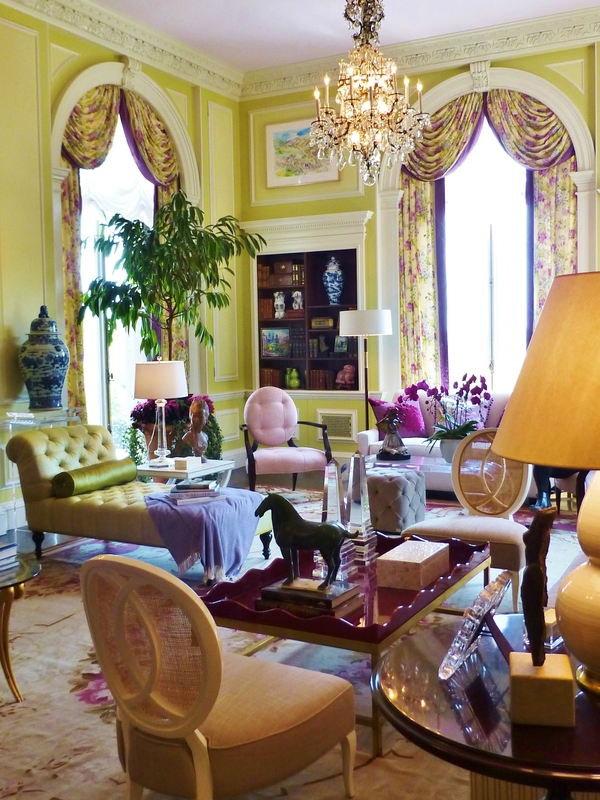 I can’t possibly end this post without first mentioning the gorgeous window treatments in this Drawing Room. The textiles used are colorful and rich. I love that, although the designer chose to use a very traditional treatment, the windows feel very current because of the saturated color in the fabric. The classic swags overlap the stately draperies and everything is banded in that glorious purple-rose ‘Radiant Orchid’ color. Inside mounted swags and full-length draperies draw the eye upward and ground the light green color-scheme by adding plenty of contrasting ‘Radiant Orchid’. These are beautifully done draperies! I’ll be sharing more about the rooms I saw when I toured Blairsden. 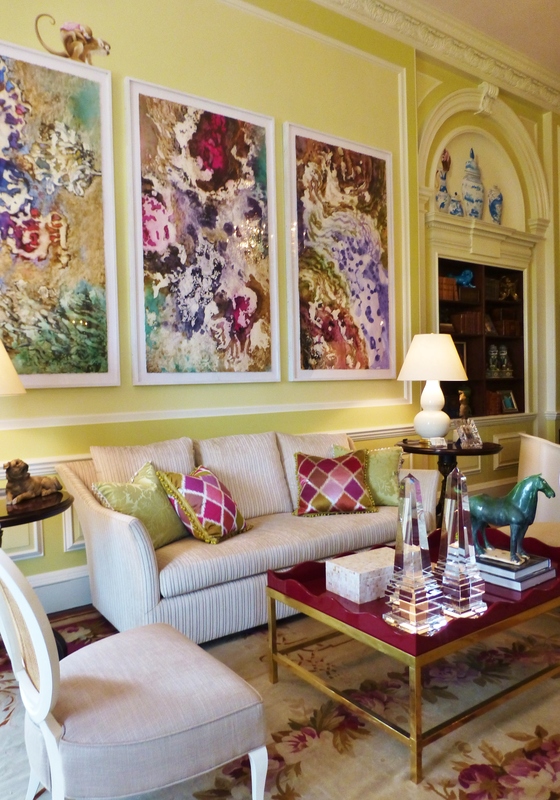 Until then, I’d love to hear your thoughts on this colorful, traditional Drawing Room. Do you love the bright colors used throughout the space as much as I do? Please feel free to comment, and share Kristine Robinson’s Blog with everyone you know–I need all the friends I can get! This entry was posted in Architecture, Designer House, Home Decor, Interior Design, Interior Design & Decorating and tagged Antiques, artwork, Color, Decorating, Draperies, Furniture, Home, Interior Decorating, Interior Designer, Interiors, Radiant Orchid, Windows. Bookmark the permalink.